We looked at the 25 most popular mountain bike tires on the market and considered them tread type, performance, bead type, weight, size options, tire widths, compounds and more. These three bike tires were way ahead of the rest in the categories we considered. Any one of them would make an excellent choice for a tire for your mountain bike. The kind of tires you have on your mountain bike makes a big difference in how good the ride is. Depending on who you ask there are many experts in mountain biking that believe and state that the kind of tires you use is the most important factor. whether you have a high performing mountain bike or one that leaves a lot to be desired. If you are looking for tires for your own mountain bike, don’t be discouraged or overwhelmed by the sheer numbers of choices that are available. There are some things you can do that will make the process easier and less confusing. The objective of this guide is to help steer you through the process of choosing the right set of bike tires for your bike that will give you the performance you’re looking for. With all of the choices available you may feel like you are in over your head but after you read this buyer’s guide, look at the reviews of these top rated bike tires and decide what type of riding and terrain you want to do, you will feel like an old pro. 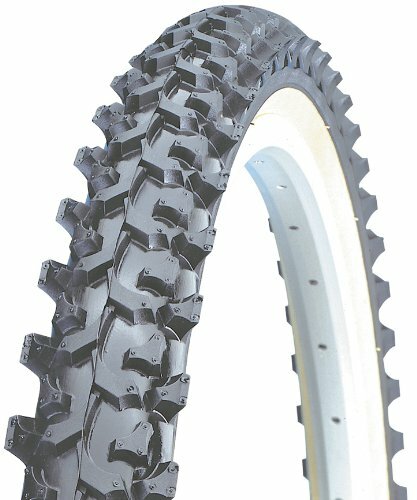 Another winner from Kenda is this Nevegal Mountain Bike Tire that will work for the front or back of your mountain bike. The Dual treat gives the rider much faster acceleration off the center line and cornering grip us better too. These tires have won the MTN Bike Magazine Tire of the Year award two times. The side wall shield provides a protective tape that adheres to the sidewall of the tire. This protective tape is thin and offers the most puncture resistance protection but doesn’t increase the weight of the tire. The aggressive knob is deep and keeps good grip to loose ground as well regardless of the condition. When looking for good tires you want to find quality that will last, that stands up under many different riding conditions, that is puncture resistant and also that is worth the money that you have spent. Give these tires a try if you’re looking for award winning tires that will last you a long time. The block designed, large side knobs with give the rider plenty of edges for taking high speed corners without losing stability. 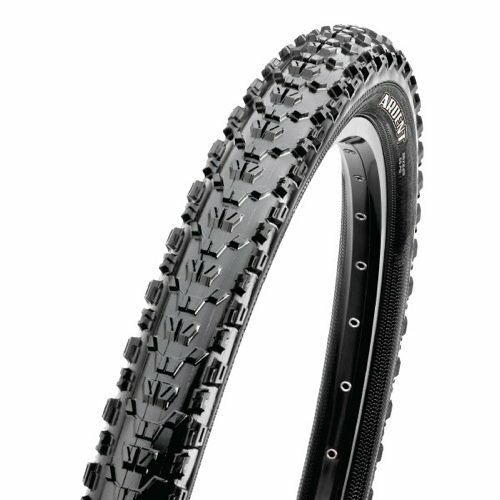 Maxxis Ardent Mountain Bike Tires are enjoyed by both amateur and professional riders. They have been tested and found to be exceptionally durable and are designed to provide the rider with plenty of traction in most types of terrain. The tread of these tires are made for the accelerating and braking traction that prevent it from getting out from under you. The knobs have been upgraded to minimize the amount of rolling distance. There is a large variety of sizes that you can choose from when it comes to these tires. They are a very good choice when you want to replace the tires on your bike with good quality mountain bike tires. Kenda Alpha Bite is an aggressive mountain bike tire that offers plenty of traction in the dirt but is designed in a way that makes pavement riding efficient as well. This mountain bike tire measures 26 x 1.95”. These mountain bike tires can be used on pretty much any surface and provides plenty of stability even if you have been riding for a few hours. These great tires can last you longer than 5 years with proper care and you will find them very durable as well. If your tires get dirt or mud in between the treads they can be easily rinsed clean. The Kenda K850 weighs about 1.4 pounds. Whether you’re riding in mud, crushed gravel, pavement, off road trails or dirt, you will find the ride is stable and enjoyable. The thick sidewalls do well on up and downhill riding and can even handle a cactus trail with ease. If you know you’ll be traveling on some rough terrain, you can get liners for the tires so nothing can get a hold of the tube and damage it. The grip is good, allowing the rider to go as fast as they desire and the grip will remain constant. If you’re looking for an exceptional replacement for a standard 26” tire, this is it. If you are an avid mountain bike enthusiast or you have an interest in getting into mountain biking, you want to find the best equipment you can find. A great quality bicycle with the right biking tires can make an average bike ride something special. Mountain bikes are bicycles that were created to be ridden off-road. The terrain that you will normally be riding over includes unpaved, rocky and steep areas like logging roads, mountain trails and dirt trails. Since you will be handling terrain like this, you want to make sure that your bike has the type of tires that will help you get the ride simple and memorable. The three top rated mountain bike tires featured above are all excellently made tires that will be an excellent replacement for your existing tires. They feature durable, puncture resistant sidewalls and heavy duty tread that maintains grip regardless of the conditions. You will enjoy traveling over the rocky terrain and rough conditions with ease. There are many different features that you want to look for in the tire you choose. We’ve put together a list of the most important features to look for in the style tire you choose. Traction in the mud – The tread on a tire that has good traction in mud will have knobs that are spaced well and are pointed slightly. This design penetrates the mud to get to the firmer ground underneath and also helps to release the mud rather than have it get packed into the tread. Loose over packed/Loose rocky traction – The tread on this type of tire is very chunky, especially on the shoulder and is very aggressive. There are a lot of bars that run horizontally and knobs that are good for climbing, braking and cornering. It is the traditional “knobby tire” design. Hard packed and smooth traction – This will provides a lot of low profile and smaller knobs on the tread. Traction and speed in sand – The type of tire is wider and has low profile small knobs on it. You want to avoid digging down into the sand and the wider tires and smaller knobs allow the tire to have a floating effect on top of the sand rather than getting bogged down into the sand. Accelerates faster – These lighter weight tires change direction, climb, accelerate and stop much quicker than other styles. Tough and more Durable – a tire that has 2 ply construction or heavier are resistant to pinch flats, punctures and can better handle the rocky or rough terrain that mountain biking often has. Another benefit to a tougher and therefore heavier tire is that when you are riding on the trails, you will notice that it feels a lot more grounded. Packing capability – There are tires that “fold” which make traveling with your bike much easier. These folding tires are almost always made from Aramid bead fibers and popular and flexible Kevlar. Comfortable Rides – A wider tire will provide the rider with a much more comfortable ride. Wire Bead – A wire bead tire is built to be strong and durable. There is a strip of wire in the bead of this type of tire that will keep it in place and sturdy as well. They are very popular with mountain bike enthusiasts that do downhill riding because they stand up to rough, rocky terrain well. Wire bead tires are a lot heavier than the other type because of the wire inside and how stiff it is. Because of this, they can sometimes be hard to fit. Folding Bead – There is no wire in the bead of a folding tire. This type can actually fold up because of the fact that there is no wire. The bead of a folding tire has been made from Kevlar, a very popular and super strong fiber that is often seen in racing tires and even armor for the body. A folding bead tire will be much easier for the rider to fit but one drawback that has been noted is that they can stretch after a bit of time. The tread of a tire used for mountain biking will have an effect on its performance. There are four types of tread that a tire can have. We’ve outlined the four different kinds and the pros and cons of each. Knobbed – This versatile tire has good traction on the road or off road as well. A disadvantage to this type of tread is that it can be bogged down with mud. Combination – This type of tread will handle going fast on the harder ground while gripping well on softer ground. It is created to do well on multiple types of surfaces. It is heavier than a lot of other tire styles and can lack acceleration. Inverted – Inverted tread tires will do well on roads and sidewalks. You will be able to get good speed as well. The inverted tread provides smooth rides even on uneven surface. On loose ground the inverted tread tire doesn’t do as well due to less traction and it tends to produce bad performance as well. Treadless/Slick – On pavement and roads it doesn’t get much better speed wise than when using a treadles tire. It is a good tread style for those who use their bikes strictly for commuting. Treadles tires have no grip in wet conditions. It is completely useless for any kind of off-road riding. When it comes to choosing the right tires for your bike, you will need the right knowledge and will have to research the different elements and factors that make up a great tire. Different tires will suit different styles of riding better than others. By taking the time to research the different styles and familiarize yourself with the different tread types, features and bead types, you have given yourself an advantage. This advantage will make it much easier to sort through the large number of mountain bike tires that are available on the market. The right knowledge can help you search with confidence and make a decision that you will be happy with when you are riding your mountain bike. One important factor to remember is to know exactly how you will be using your mountain bike for and on what types of terrain and conditions. This information will steer you towards the best tires for you.